"I obtained BPM's details via a friend who highly recommended their services and I too would do the same. From start to finish the whole experience with BPM was both a pleasure and very professional. 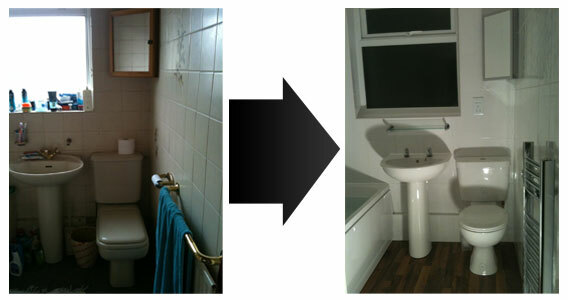 With 3 major repairs and modifications to implement requiring the coordination of scaffolding, skips, ordering materials including windows as well as the installation of a complete new bathroom, Simon was able to deal with all this and address any delays and unexpected problems like a military operation. All along the way, he provided regular updates on progress, which was not easy as I was abroad at the time. Even the visit to B&Q with Simon to help select material for the bathroom was a pleasant and stress-free experience. On completion of the work, BPM left my house in a clean state with no evidence of any work being carried out ... except for the spanking new bathroom of course! Will definately use BPM again." "Brookes Property Maintenance has recently undertaken some work on a neighbour’s property and we contacted them based on their recommendation. They attended our house in December to investigate a small but noticeable damp patch which had appeared inside by the stairwell on an outside wall. On further inspection outside a problem with the garage roof was revealed. BPM provided us with a humidifier which they left with us for a few weeks to tackle the immediate problem inside the house whilst they calculated the estimate and planned the job. The written estimate was extensive, detailed and informative stating exactly what the job entailed, and it was also realistic and not ‘inflated’ in any way. BPM discussed the various choices available to us ensuring we were aware of all facts to be considered. BPM was supportive, understanding and patient in their approach especially when dealing with the expenditure which was a concern to us. Our final decision was based on the option that was most likely to have longevity and durability, and whilst not cheap we felt the cost was realistic and competitive. A skip was hired and work began. The damp patch was retraced to the source of the problem – a fractured length of guttering. This was replaced but other problems were revealed en route to this diagnosis. Each obstacle encountered was dealt with systematically and every stage explained clearly and discussed with us before proceeding. BPM worked with established connections with other business and skilled craftspeople in specific related areas. Employment of these were arranged to coincide with our needs. The working conditions throughout the job were excessively challenging due to the unseasonal weather but BPM continued regardless and worked on into the evening on one occasion to complete the day’s work to ensure it was water tight. Genuine, reliable, trustworthy and honest are how we would describe Brookes Property Maintenance and they will always try to ‘go the extra mile’ for the customer. The quality of their work is exemplary. We therefore have no hesitation in recommending them to carry out work of a similar nature."